Drafts let advertisers prepare and review changes to a campaign without actually making those changes live and impacting the existing campaign. It’s almost as if you’re making changes to a campaign in AdWords Editor in the sense that nothing will happen with it unless you make those changes live. If you’re happy with the changes that you’ve made in the draft, you can then apply them to the original campaign. 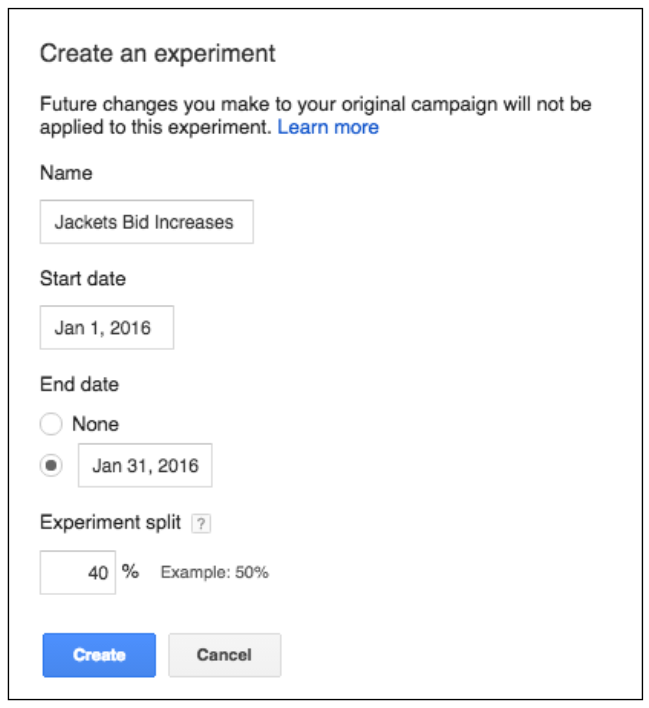 Experiments allow advertisers to test changes in their campaigns in a controlled environment, so you can see how well your draft campaigns will perform. You need to set how long you want the experiment to run for and decide how much traffic and budget to split between your experiment (draft campaign) and your original campaign. Advertisers can monitor results of the campaigns in two ways; using the performance scorecard and evaluating ad group level performance. If you’re happy with the results of your experiment, you can apply these changes to your original campaign or just convert your experiment into a new active campaign.